Open theism is a model of God emphasizing divine love and responsiveness to creatures. The term “open” is used in two important ways: (1) God is open to what creatures do and (2) the future is open in that there is more than one possible future. What we call “the” future is not an already determined blueprint of what will happen—it is not set in stone. Rather, it is like a create your own story book. It resonates with the spirituality of many Christians throughout the history of the church especially when it comes to prayer. Many Christians feel that our prayers or lack of them can make a difference as to what God does. It also addresses questions about how we should understand God’s role in suffering and evil in our lives. God gives freedom to humans and does not micromanage what happens. God enters into genuine give-and-receive relations with creatures. For example, God truly responds to our prayers. God responds to contingencies and adjusts divine plans, if necessary, in response to our prayers and actions. Though the divine nature does not change, God does have changing emotions, plans, and actions. Also, because God chooses to elicit our free collaboration in divine plans God takes risks that we will act in ways contrary to the divine intentions. The model arises out of theological traditions that affirm human freewill but modifies them on two key points. First, open theism holds that God is temporal and everlasting rather than timeless (atemporal). Second, because the future exists as possibilities of what might happen God possesses what is called dynamic omniscience in which God has exhaustive knowledge of the past and present and understands “the future” as what might happen. Divine omniscience is dynamic in that God constantly acquires knowledge of which possible future actions creatures select to actualize. The so-called “future” does not exist as a reality and since God knows reality as it is, the future is not known. God is not caught off-guard-since God knows the possibilities and anticipates what we will do. Open theists reject other accounts of divine knowledge such as simple foreknowledge or middle knowledge. The affirmation of divine temporality and dynamic omniscience are the most controversial elements in this proposal. However, the watershed issue in the debate is not whether God has exhaustive definite foreknowledge of future events but whether God is ever affected by and responds to what we do. This is the same watershed that divides theological determinism (such as Calvinism) from traditional freewill forms of Christianity such as Eastern Orthodoxy, Wesleyanism, and Arminianism. The name open theism was coined in the 1990’s by a group of theologians and philosophers though the view actually existed prior to the time of Jesus and there are Jewish and Islamic varieties as well. Support for the view utilizes reasons from sources such as the Bible, theology, philosophy, and life experiences. Though proponents believe a strong case for open theism can be made, they do not claim that it is the only rational position that Christians can affirm. Information on support for the position and who has affirmed it in history is available in the articles in this section. 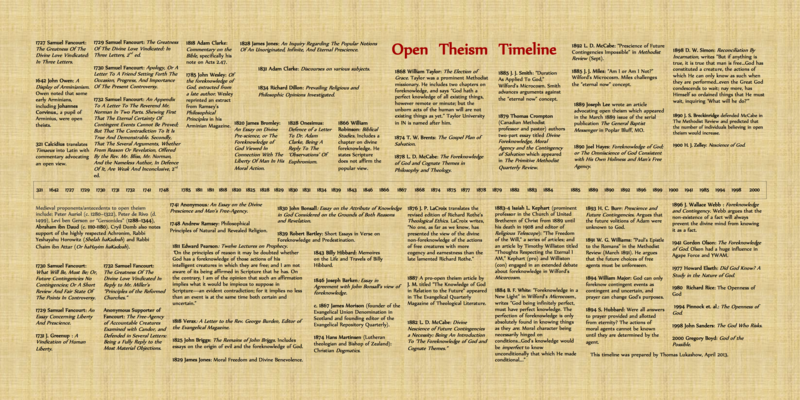 View the complete Open Theism timeline on The Open View, courtesy of Tom Lukashow.